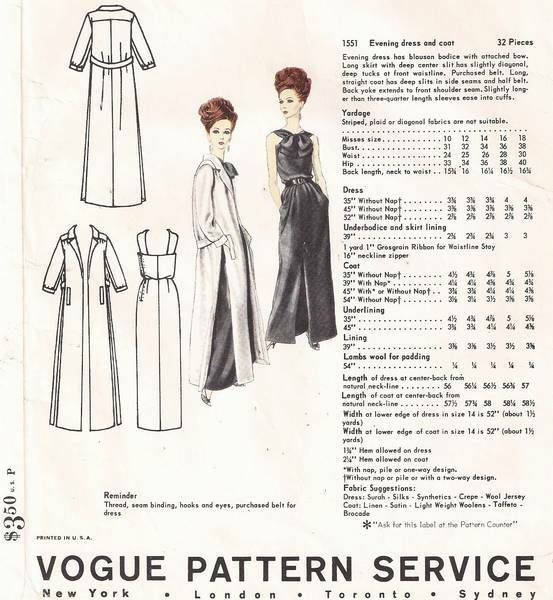 Vintage 1960's Vogue Paris Original pattern for evening dress and coat designed by Nina Ricci. Evening dress has blouse bodice with attached bow. Long skirt with deep center slit has slightly diagonal, deep tucks at front waistline. Purchased belt. Long straight coat has deep slits in side seams and half belt. Back yoke extends to front shoulder seam. Slightly longer than 3/4 length sleeves ease into cuffs. Pattern is uncut, complete and in original folds. Envelope has wrinkling and a bit of edge wear. Contents are in excellent condition. Included is a "Vogue Paris Original" sew-in label. This pattern was featured in the December 1965 issue of the Vogue Pattern Fashion News.